Manuel Neuer, Germany's Captain Fantastic, returned to competitive football on Sunday on the biggest stage of all after a nine-month absence but his comeback ended in intense frustration as the world champions lost 1-0 to Mexico. The giant Bayern stopper has been sidelined since fracturing a bone in his left foot last September in a recurrence of an injury he suffered earlier in 2017. 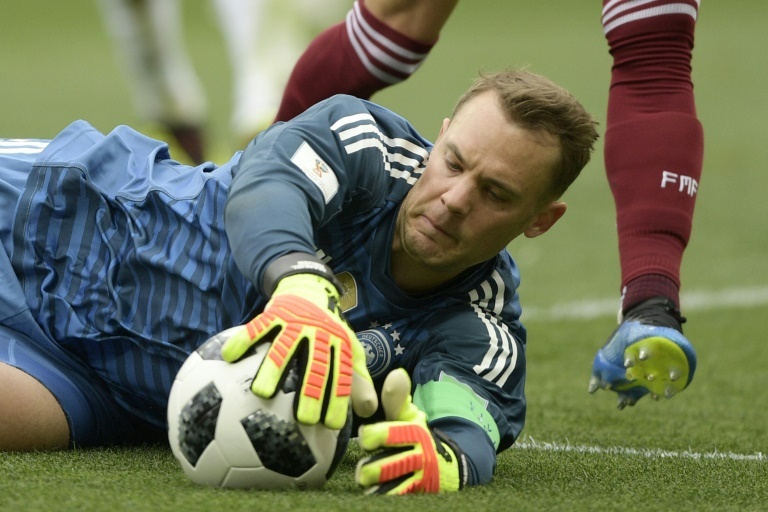 Neuer's return to the national side was carefully stage-managed -- two games were set up behind closed doors just to give him match practice -- and it was no surprise when he was announced as the number one for Russia. Wearing a blue jersey, with a bright green captain's armband, Neuer led his team out onto the pitch in front of 80,000 people at the Luzhniki Stadium, hugging his defenders before clapping the massed ranks of flag-waving German fans behind the goal. The 32-year-old was first called into action in the second minute, pouncing to smother the ball after it was whipped into the box from a Mexican corner. Moments later he was up towards the half-way line, launching an attack before making a couple of comfortable saves as Mexico probed. Mexico looked the more creative and dangerous team throughout the first period and finally made their superiority count in the 35th minute when Hirving Lozano drove into the area, checked and beat Neuer at his near post. Neuer, who joined Bayern from Schalke in 2011, is credited with redefining the role of goalkeeper, playing as a "sweeper-keeper" and operating partly as an outfield player to launch attacks for his team. Germany goalkeeping coach Andreas Koepke has even suggested he has "never seen a better sweeper, apart from maybe (Franz) Beckenbauer". 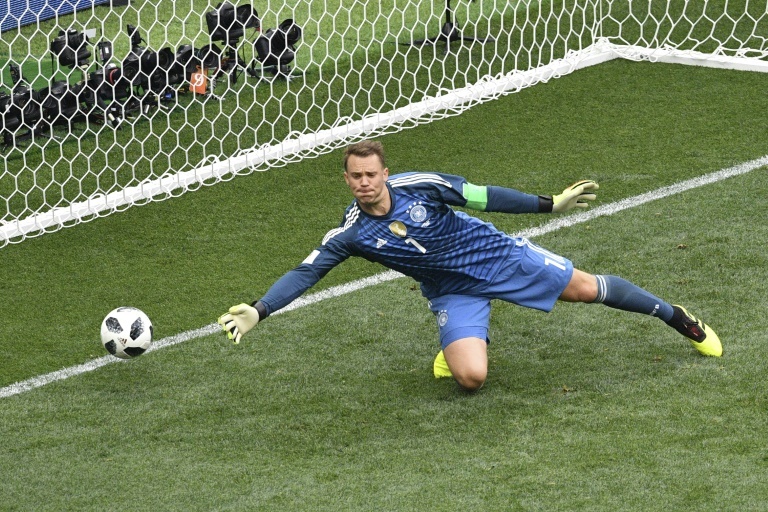 Neuer was a key player in Germany's World Cup triumph in 2014, winning the Golden Glove as the tournament's outstanding goalkeeper as the side let in just four goals in their seven games in Brazil. For large periods of Sunday's match at the Luzhniki, the goalkeeper, who stands six foot four inches (1.93 metres) tall stood well outside his penalty area, directing play from the back. In the second half Neuer, wearing bright yellow boots and yellow and orange gloves, was a virtual spectator as Germany dominated possession. As frustration mounted, he tried to haul Javier Hernandez to his feet after the Mexico forward went down in the box. With the minutes ticking away Neuer was standing in the centre circle as his team huffed and puffed, searching for an equaliser. In injury time he ran forward to join the German attack for a corner, staying up front as German made one last desperate throw of the dice. But it was not to be and he led his defeated players to thank the German fans. Neuer played for Germany in recent friendlies against Austria and Saudi Arabia in the build-up to the World Cup. "You couldn't tell that he'd been out for so long," said Germany coach Joachim Loew after Neuer's performance against Austria. Neuer himself apparently never doubted that he would make it to Russia, saying his careful reintroduction had been a deliberate ploy, when the squad was announced earlier this month. "I always thought I would be going to the World Cup and I didn't want to take any risk," Neuer said. Risk or no risk, he certainly knows he's in a scrap now.